Our International Conference in Commemoration of the International Women’s Day: ‘Women, Works and Culture’ II, 2012 is offering an opportunity to enjoy a weekend of lively interaction with a variety of elds professionals on the University’s picturesque Sungkyunkwan Campus, Institute Français, and Daehangno Arts Theater(Small Hall). 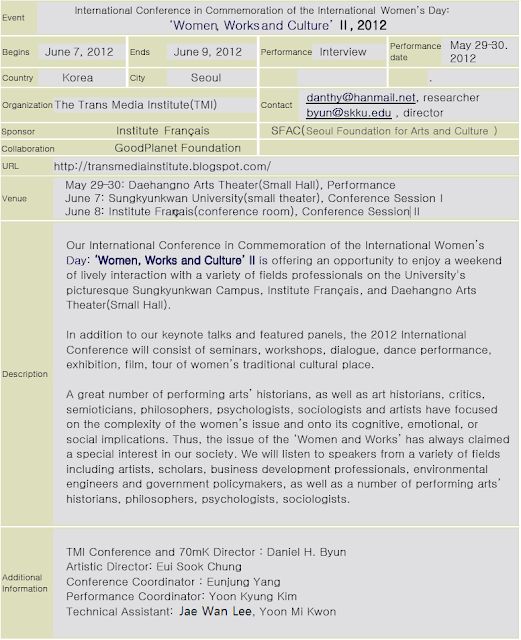 In addition to our keynote talks and featured panels, the 2012 International Conference will consist of seminars, workshops, dialogue, dance performance, exhibition, lm, tour of women’s traditional cultural place. A great number of performing arts’ historians, as well as art historians, critics, semioticians, philosophers, psychologists, sociologists and artists have focused on the complexity of the women’s issue and onto its cognitive, emotional, or social implications. Thus, the issue of the Women and Works has always claimed a special interest in our society. We will listen to speakers from a variety of elds including artists, scholars, business development professionals, environmental engineers and government policymakers, as well as a number of performing arts’ historians, philosophers, psychologists, sociologists. If this is your rst conference with us, welcome. You’ll nd a wide range of activities -workshops, seminars, and much more -that are sure to re up your imagination. We offer plenty of new, stimulating opportunities to keep you intrigued. Below you will nd descriptions of the event offerings for this June. Check back soon and you will nd descriptions of our events offerings available. Attendees enrolling in one day Workshop meet Friday afternoon. Workshop is led by our highly accomplished conference guest speakers. Spend several hours in a small, intimate setting practicing lecturing, discussion, and learning from guest speakers. Workshops will be a great place to get feedback from guest speakers from the Foundation GoodPlanet in France. For information about workshop, visit our http://transmediainstitute.blogspot.com/ Space is limited to Seventy participants so be sure to sign up early! This conference we are happy to announce different two-hour intensives that will allow you to study with one of our featured presenters. • Kyung Sun Lee, Professor & CEO of With Culture, co.